We teach Chen Taijiquan old style 56 form, which comprises of soft, graceful and flowing movements, interspersed with brief moments of explosive energy release or 'fa'jin'. This system can be practised by anyone, regardless of age or any previous martial arts experience. The beauty of Chen Taiji is in the fact that it can either be performed slowly from start to finish purely to improve health, increasing blood flow, coordination, flexibility and balance, or performed at speed, for cardiovascular fitness, martial arts applications and practical self defence purposes. 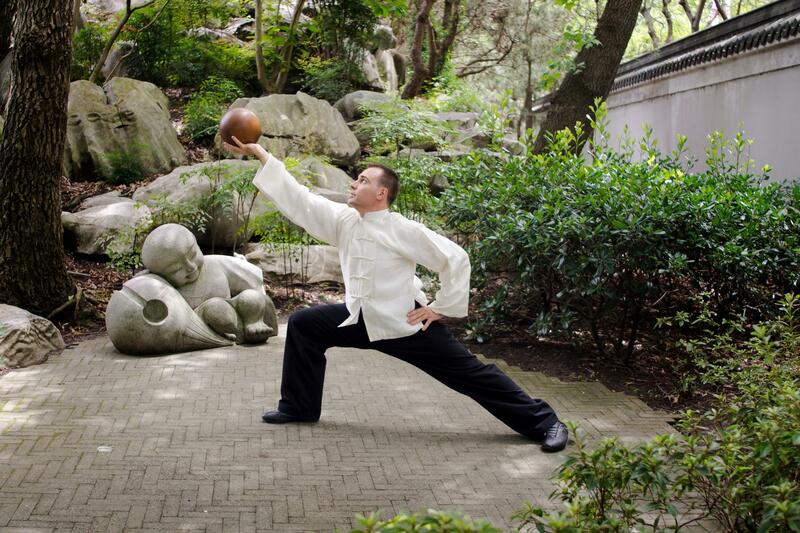 You will learn to coordinate your whole body to move as one with Chen Taijiquan. A rare part of traditional Taijiquan training, very few contemporary Taijiquan instructors are familiar with, or teach, this integral part of the system. Taiji Ball Qi Gong is one of the most beneficial forms of exercise available, as unlike most modern resistance/weight training which lock the body into a specific plane of motion or movement, Taiji Ball Qigong instead concentrates on moving the body as a one unit, focusing on initiating all movement from the lower Dan Tian area. This exercise aids in strengthening the muscles, tendons and joints of the body, specifically the back, hips and legs, which will aid in flexibility and more mobility as we grow old. Taijiquan practice has a multitude of health benefits including strengthening the muscles, sinews and tendons of the body, increasing flexibility and blood flow, improving balance and coordination, reducing stress, and providing a low impact form of exercise that can be trained either slowly and rhythmically, or if preferred, with speed and power for realistic self defence applications, as is the true tradition of this ancient martial arts system. Taijiquan is a style of internal martial art that combines the techniques of leading and guiding energy with controlled breathing, and fluid, graceful movements that mask the deceptive power hidden within. Chen Taijiquan focuses on the eight basic methods of martial practice: Peng (ward-off), Lu (rollback), Ji (push), An (press), Cai (grab), Lieh (Break), Zhou (elbow strike), and Khou (shoulder strike). Although contemporary Taiji is practised for a wide variety of reasons including health improvement and also sports competition and demonstration, our school prides itself on retaining and teaching the true martial aspects of the style. We teach not only the 'form' or movements, but also their applications in combat situations. Our system also teaches 'Push Hands' and Taiji Ball Qi Gong, which are fundamental practices that bring Taiji movements to life, and provide practitioners a real understanding of the dynamics involved in this often misunderstood martial art. Taiji Push Hands is the practical application of the Taijiquan form and can teach a practitioner how to deal with an attacker, by leading and guiding their energy or force to upset or 'uproot' their balance, taking away their centre of gravity with a minimum of physical force. It's a safe and fun form of exercise that can allow practitioners to be able to experience the subtlety of combat, without the risk of injury. Another type of training we offer is Taijii Dao. In China, the Dao is referred to as ’The General of All Weapons’, and is known as one of the four major martial weapons, along with the gun (stick/staff), qiang (spear), and jian (sword).